We’re taking a break from posting wedding and engagement photos with this editorial for Bride and Breakfast. These are wedding gowns from the Ivory and Lace collection of..wait for it..the Landmark Department Store. Yes! That’s Landmark. When I saw these dresses, I was quite impressed with their quality and style that I didn’t think these are available in a department store. My favorites are the embellished dress with the rose gold ribbon belt and that plunging back gown that’s simple yet very elegant. It’s not impossible to see these in real weddings, now that more couples are smarter with their wedding preparations. Of course there are still a lot of advantages in having a personal couturier for the bridal gown but for those who would better allot their budget for other wedding suppliers, this collection is undeniably a good choice. Other than having a nice set of wedding gowns for this editorial, I think it’s also a great showcase of how we can capture bridal portraits given two flat walls and a couple of chairs. 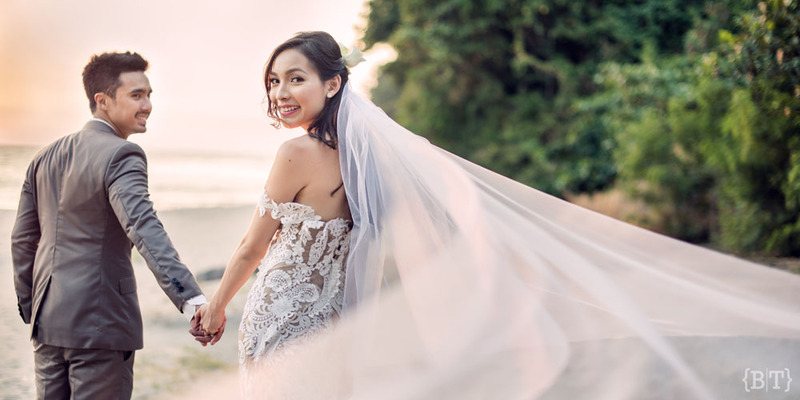 Variety is king when it comes to capturing weddings since it tends to be boring and redundant to have photos in the same dead on-eye level angle. That’s probably why we discipline the team to always challenge themselves – push the envelope and think of ways to come up with something interesting..even if it’s just a wall.